When it comes to relationships, Colin Singleton's type is girls named Katherine. And when it comes to girls named Katherine, Colin is always getting dumped. Nineteen times, to be exact. On a road trip miles from home, this anagram-happy, washed-up child prodigy has ten thousand dollars in his pocket, a bloodthirsty feral hog on his trail, and an overweight, Judge Judy-loving best friend riding shotgun - but no Katherines. Colin is on a mission to prove The Theorem of Underlying Katherine Predictability, which he hopes will predict the future of any relationship, avenge Dumpees everywhere, and finally win him the girl. 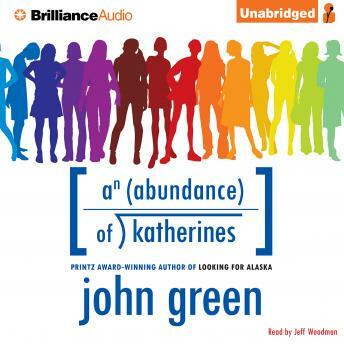 Love, friendship, and a dead Austro-Hungarian archduke add up to surprising and heart-changing conclusions in this ingeniously layered comic novel about reinventing oneself by Printz medalist John Green, acclaimed author of Looking for Alaska. This is a light, quirky adventure story for teens and older. It's well-written and easy to listen to. I have to admit, I'm slightly incredulous that Colin was able to actually get so many girlfriends when he was too socially inept to have any friends; he's not easy to dislike, but he's not easy to like either. It's not heavy-hitting literary fiction, but it's a great story nonetheless.